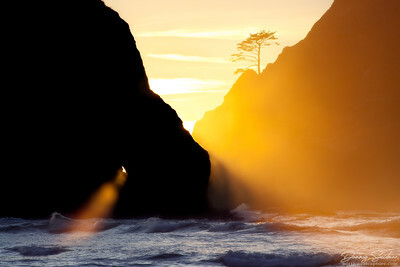 With the sun low on the horizon, its warm rays penetrate thick sea spray produced by the pounding surf at Olympic National Park's Point of Arches. 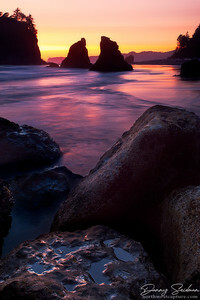 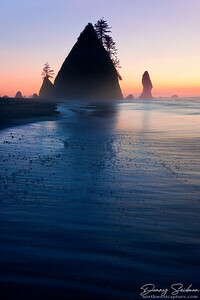 Photographed at sunset on the Olympic Coast, enormous sea stacks rise from the rocky landscape and ocean. 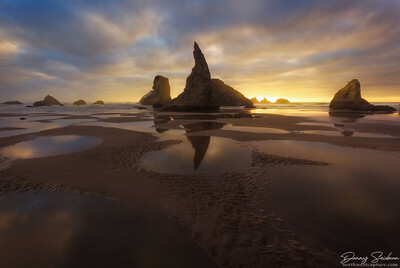 Pools are left behind as tides recede from the beach in Bandon, Oregon. 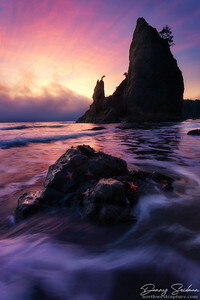 An incredibly vivid afterglow on the California Coast allowed for this beautiful seascape image. 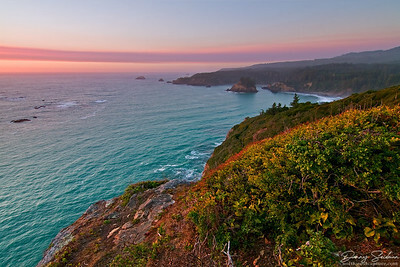 Overlooking the sea from cliffs along California's northern coast. 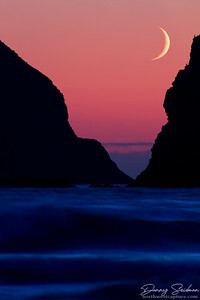 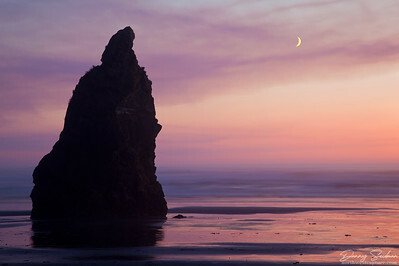 The moon sinks in the sky between two sea stacks shortly after sunset. 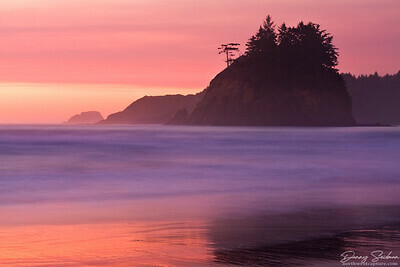 Color radiates from the setting sun as seen from the shores of Garibaldi, Oregon. 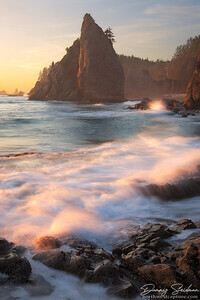 Waves roll in at sunset on the Olympic Coast of Washington. 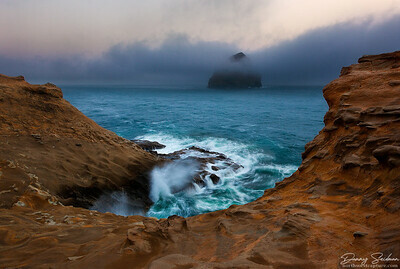 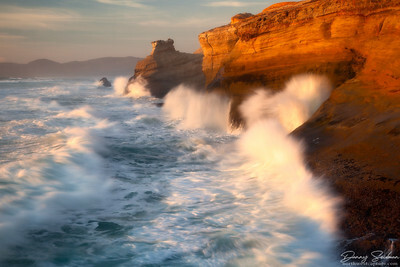 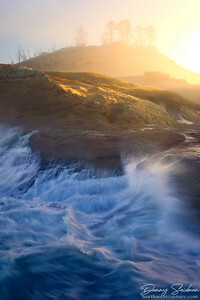 Waves crash against sandstone cliffs at Cape Kiwanda as the golden early-morning light glows in the moisture-laden air. 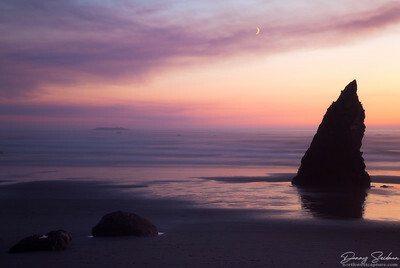 The thick, moisture-laden air of the Olympic Coast is aglow with the pastel hues of dusk as the moon closes in on the horizon. 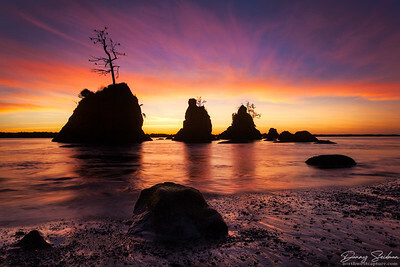 The sun sets on the rugged Olympic Coast. 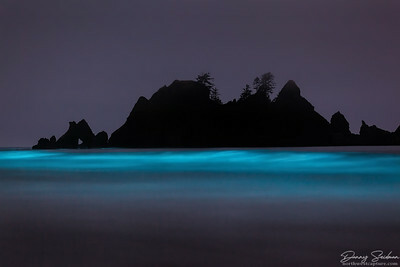 Noctiluca is a dinoflagellate, that when disturbed, has the ability to bioluminesce. 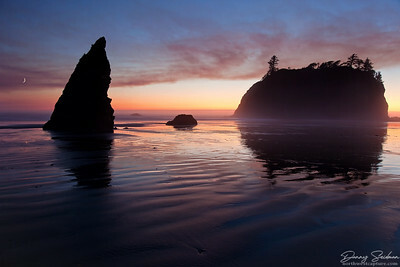 This bloom was large enough for an easily visible indigo-blue color to be produced in the waves rolling ashore at Shi Shi Beach. 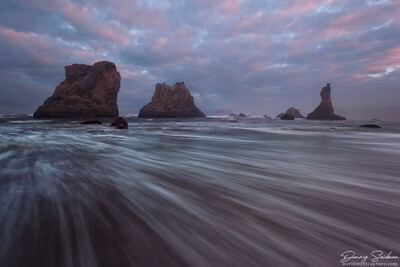 A wave of ocean water at Bandon Beach retreats as surnise illuminates the clouds overhead. 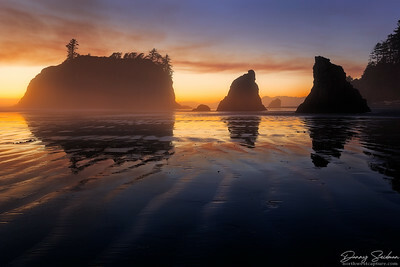 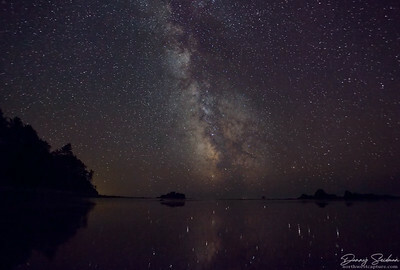 Stars reflect off the wet sands of Ruby Beach in Olympic National Park. 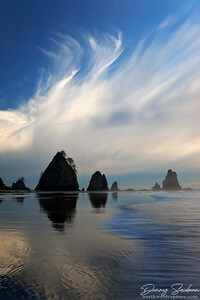 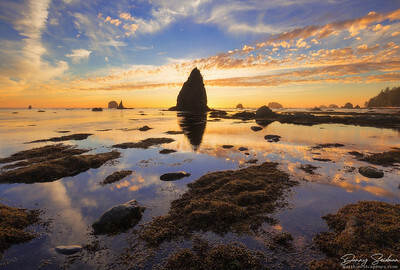 A beautiful display of late-afternoon cirrus clouds perfectly complement the sea stacks on Shi Shi Beach. 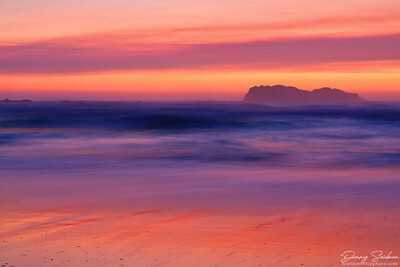 This ocean scene is set aglow with the pastel colors of sunset. 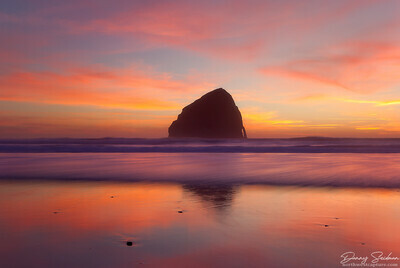 Following sunset, the marine layer that previously lingered on the horizon sweeps toward shore, enveloping Haystack Rock with its advance. 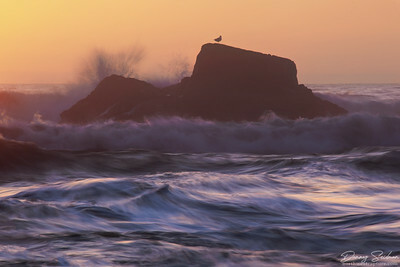 Waves crash ashore during vivid sunset on the Northern California coast. 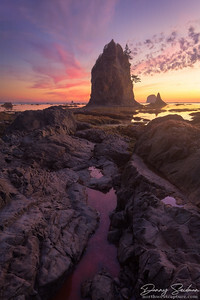 Seastacks tower above the calm and reflective waters during sunset along the Olympic Coast.